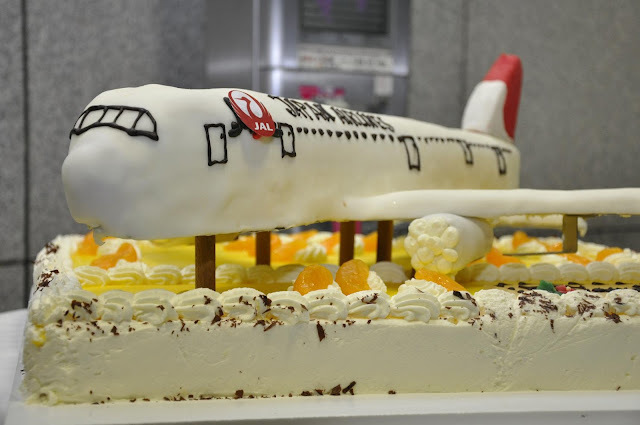 Japan Airlines (JAL) celebrated the 50th anniversary of its Tokyo - Frankfurt route on October 4 2012. A JAL mini Oktoberfest was held at the departure gate of JL408 to celebrate the occasion and the lucky passengers also received some special gifts from JAL too! The lucky passengers on this flight also receive some special souvenirs. In addition to the standard certificate, they also received origami cranes made by JAL staffs and a timetable showing JAL's flight schedules to Europe back in October 1962. Turns out back in the days when JAL first launched the Frankfurt route, it took the passengers approximately 28 hours to get from Tokyo to Frankfurt :o It was originally operated with a 2 class configured Convair 880. The crazy routing was Tokyo Haneda - Hong Kong - Bangkok - Calcutta - Karachi - Kuwait - Cairo - Rome - Frankfurt. A total of 7 meals were served during the entire journey LOL Can you imagine eating 7 meals within 28 hours :o Nowadays the Tokyo Narita - Frankfurt flight only takes about 11 hours! JAL official Facebook page (Japanese only) has posted an article and photos of the celebration.